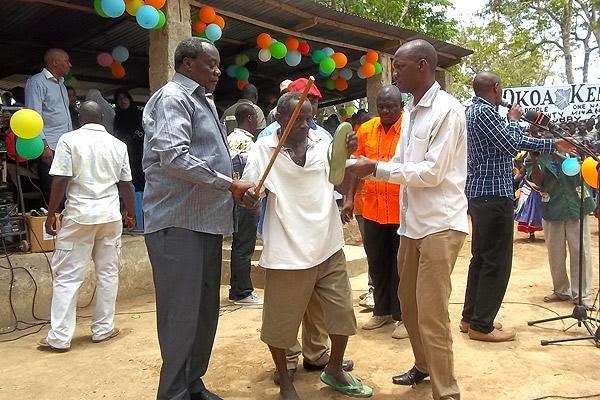 A man attacked former PM Raila Odinga and Kwale Governor while the two were dancing on the podium at a CORD rally in Kinango. The man whose motive of the attack was not immediately made clear, caned the former PM twice and went further to attack the governor before he was floored by the County’s Communication boss. While the area OCPD claim that the man didn’t assault Raila but was dancing a traditional dance where participants cane each other, sources within the former PM’s security believe that the man meant to harm Raila. Raila immediately ordered that the man be released as he has forgiven him. The function was attended by Senators Juma Boy, Hassan Omar, Agnes Zani, James Orengo, Johnson Muthama and MP Hassan Mwanyoa. A section of Coast MPs led by Kilifi North MP Gideon Mung’aro, Malindi MP Dan Kazungu, Kilifi Woman Representative Aisha Jumwa, Ganze MP Peter Shehe and Kilifi South Mustafa Idd have been insulting Raila and the Okoa Kenya team in various rallies but no action has ever been taken on them.